My holiday season reading continues with Atom Yang’s debut short story Red Envelope. I’ve been looking forward to this since I met Atom at GRL in November and had the chance to talk with him about the story and his writing for an episode of Jeff & Will’s Big Gay Fiction Podcast. Red Envelope is the story of Clint and Weaver, long time friends who traditionally only see each other to celebrate the lunar new year. Clint is Chinese-American and Weaver is a Caucasian and over the years there’s also been an attraction between them. When the attraction is acted on, it seems as though it’s the end of the relationship. Or is it? Atom weaves a compelling story here as Clint tries to reconcile what’s going on with his friend, who moved to China to take a job and cut off talking to Clint. Among the things I loved in the story are the look at Chinese traditions, relationships between Asians and Caucasians and a sweet love story that is trying to find its way. The interaction between Clint and Weaver is delightful. Clint is eager, yet guarded. Weaver is just lovable, even though he’s got some baggage, and it’s no wonder that Clint falls for him. The glimpses we get of Clint’s family are wonderful too. It’s the kind of family anyone would want to be around during the holidays. I thoroughly enjoyed this short, and look forward to reading more from Atom (even better would be more about Clint and Weaver and where they go from here). 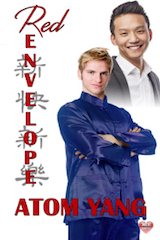 Thanks for reviewing “Red Envelope”! I’m glad you enjoyed it.